Let our gleaming tower of cream and gold stars dazzle and delight your most valued clients and dearest family and friends. 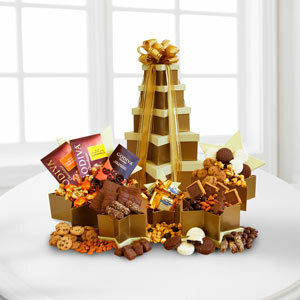 Show them your love and appreciation with this generous gift of chocolate and sweet snacks. Each star-shaped gold box holds a variety of goodies, including: Godiva dark chocolate covered pretzels, Godiva signature biscuits, Ghirardelli milk and caramel squares, white and milk chocolate enrobed sandwich cookies, roasted almonds, Godiva milk chocolate salted toffee caramels, gourmet popcorn, chocolate chip cookies, almond Roca, Godiva milk chocolate caramels, dark chocolate covered almonds and milk chocolate grahams.